Rediff.com » News » Is Modi more popular in 2019? 'Through skilful propaganda, Narendra Damodardas Modi has become an uncle-teacher-guru figure to large swathes of the country,' believes Mihir Sharma. It is hard to have a conversation these days without the subject turning eventually to "What will happen in 2019". This will not be, naturally, a discussion about any of the other events that might take place in this new year; it is, always and everywhere, a question about the general election. And, in fact, it is usually a question about a single number: How many seats will the Bharatiya Janata Party win? Of course, the only correct answer to that question is: "Nobody has the slightest idea". But, for some reason, people seem to be extremely dissatisfied with that answer. So let's break down the uncertainties, so at least we know why we don't know what we desperately want to know. First, we don't know how much popularity the prime minister has gained or lost over the past couple of years. There are some indications that he is less popular than he was earlier: People are more given to mocking him, for example. The tracking data collected by various psephologists, especially at the Centre for the Study of Developing Societies, also seems to suggest that his popularity peaked a few years ago. Anecdotally, people will say that it peaked sometime between demonetisation and the launch of the goods and services tax -- perhaps, fortunately for the BJP, at the time of the UP elections. But it is also true that he might be more popular than he was earlier. This is my own view. In 2014, he was a relatively unknown quantity, and benefited from the apparent difference that he brought to national politics. But, in 2019, he is an institution. There is a generation of young Indians that has grown accustomed to his style; and, through skilful propaganda, Narendra Damodardas Modi has become an uncle-teacher-guru figure to large swathes of the country. In spite of disappointment at his government's performance, the PM's own popularity may well have increased. Second, we do not know what the government has planned for the next couple of months. 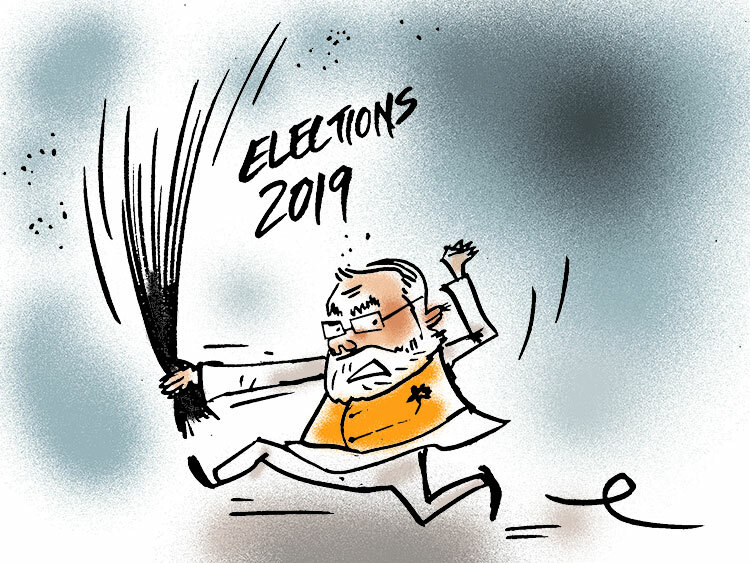 It is conventional wisdom in New Delhi that Narendra Damodardas Modi and Amit Anilchandra Shah will not go into the general election without having somehow managed the narrative through one or more 'big bangs'. These may not be of the size or reach of demonetisation. But, as the political success of the so-called 'surgical strikes' demonstrated, they do not have to be. That episode made it clear that you can, in fact, take an action that has been done before and sell whatever it may be as something completely new -- and open up a new front in the debate that you completely dominate. Third, we do not know how Opposition unity will play out. Will the Congress's success in three Hindi-speaking states mean that is is more capable of playing an anchor role for a possible coalition? Will instead it be seen as possible weakness on the BJP's part, increasing the incentive for individual Opposition parties to strike out on their own instead of standing together against the Modi juggernaut? This is something that will only play out over the next few weeks. It is important to note that this will not happen in isolation either -- the BJP will use all its resources, including the institutional machinery available to a governing party, to ensure that the Opposition does not in fact come together. Fourth, what is the real composition of the electorate? In other countries, with stable demographics and economies, it is relatively clear what the relative weights of various social groups and economic classes are. Here, not only is that not clear to start with, but it changes rapidly in just five-year intervals. Hence if we believe that the BJP is less popular in rural areas for reasons of increasing distress, what does that actually mean? How many traditionally 'rural' constituencies will actually be determined by the votes of an electorate voting on primarily rural issues? This is extremely uncertain. It has always been clear that the next election will be decided in India's traditional heartland. If the BJP sweeps it as it did in 2014 and in the assembly polls, it may miss out on 272 overall, but it will come easily within touching range of a majority government. If the Bahujan Samaj Party and the Samajwadi Party stay together, but the BJP's vote share does not fall too much, then it might win about half the seats it did in 2014 -- complicating government formation but not making it impossible. If the alliance stays together and the BJP's vote share falls by about as much it has in the by-elections, then it will lose most of its UP seats, and very likely find itself in Opposition. All Indian elections are uncertain, but this one is more uncertain than most. Rationally, there are too many imponderables. But, instinctively, for many of us, there remains the expectation that the BJP under Modi and Shah is too much of a political machine, and built up too much of a lead in 2014, to lose easily.